Chicago Odense Ensemble is a unique collaboration that came together in the winter of 2008 while Danish musicians Jonas Munk and Jakob Skøtt stayed in Chicago. Via mutual friends, and a support gig for Isotope 217 in Millenium Park, a studio session was arranged for the two to improvise and lay down ideas with some of Chicago's finest improvisers, including members of Tortoise and Chicago Underground Collective. Improvisation aren't unusual for the two Danes, however, as they were already more than accustomed to working from spontaneity and freeform structures in long-running psych/kraut/prog unit Causa Sui, and has since then participated in a number of installments of the Impetus series on their own El Paraiso Records label. During the Chicago studio session hours of loose ideas, grooves and atmospherics were recorded, ranging from loud, intense musical outbursts led by cornetist Rob Mazurek, to delicate, colorful ambiences. Later, the finest moments were edited, re-arranged, and mixed by Jonas Munk in his studio in Odense, doing a great deal of cutting and pasting, and adding a psychedelic and dubby vibe to the soundscape, using delays and effects as instruments during the mixing process. The result is something quite unique: a sonic brew that exists somewhere in between the aesthetics of impro jazz, hypnotic rock, and electronica. The closest reference for this kind of music is probably early 1970s proto-fusion jazz that strived for a similar synthesis of jazz improvisation, psychedelic rock, Eastern and African sounds as well as the use of the studio as a musical tool. Conceptually this album therefore seems more related to Miles Davis's ventures into electric music in the late 1960s that culminated in the early 1970s with albums such as Live-Evil (1971). And album centerpiece "Delivery" gives a possible answer to the mystery of what the fabled collaboration between Miles Davis and Jimi Hendrix might have sounded like, had it ever happened. Even though Chicago Odense Ensemble is undeniably modern sounding in some ways, it also reaches back to an era in music where the fusion of jazz and rock were still regarded with optimism, and where musical spontaneity and freedom seemed a vehicle for cosmic beauty rather than esoteric formalism. Personnel: Rob Mazurek - cornet; Jeff Parker - guitar; Dan Bitney - drums and percussion; Matt Lux - bass; Brian Keigher - percussion; Jonas Munk - guitar, electronics; Jakob Skøtt - drums, percussion. LP version. Chicago Odense Ensemble is a unique collaboration that came together in the winter of 2008 while Danish musicians Jonas Munk and Jakob Skøtt stayed in Chicago. Via mutual friends, and a support gig for Isotope 217 in Millenium Park, a studio session was arranged for the two to improvise and lay down ideas with some of Chicago's finest improvisers, including members of Tortoise and Chicago Underground Collective. Improvisation aren't unusual for the two Danes, however, as they were already more than accustomed to working from spontaneity and freeform structures in long-running psych/kraut/prog unit Causa Sui, and has since then participated in a number of installments of the Impetus series on their own El Paraiso Records label. 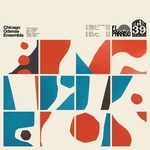 During the Chicago studio session hours of loose ideas, grooves and atmospherics were recorded, ranging from loud, intense musical outbursts led by cornetist Rob Mazurek, to delicate, colorful ambiences. Later, the finest moments were edited, re-arranged, and mixed by Jonas Munk in his studio in Odense, doing a great deal of cutting and pasting, and adding a psychedelic and dubby vibe to the soundscape, using delays and effects as instruments during the mixing process. The result is something quite unique: a sonic brew that exists somewhere in between the aesthetics of impro jazz, hypnotic rock, and electronica. The closest reference for this kind of music is probably early 1970s proto-fusion jazz that strived for a similar synthesis of jazz improvisation, psychedelic rock, Eastern and African sounds as well as the use of the studio as a musical tool. Conceptually this album therefore seems more related to Miles Davis's ventures into electric music in the late 1960s that culminated in the early 1970s with albums such as Live-Evil (1971). And album centerpiece "Delivery" gives a possible answer to the mystery of what the fabled collaboration between Miles Davis and Jimi Hendrix might have sounded like, had it ever happened. Even though Chicago Odense Ensemble is undeniably modern sounding in some ways, it also reaches back to an era in music where the fusion of jazz and rock were still regarded with optimism, and where musical spontaneity and freedom seemed a vehicle for cosmic beauty rather than esoteric formalism. Personnel: Rob Mazurek - cornet; Jeff Parker - guitar; Dan Bitney - drums and percussion; Matt Lux - bass; Brian Keigher - percussion; Jonas Munk - guitar, electronics; Jakob Skøtt - drums, percussion.